I love to make pizza. There are no rules as to what or how many healthy toppings you can put on your pizza. If I am short on time and I need a quick healthy dinner I can always turn to pizza as a quick easy recipe. One of the great things about homemade pizza is you can make your pizza vegetarian, meat lovers, or a mixture of protein and veggies all in one meal. There are many different ways to make a pizza. 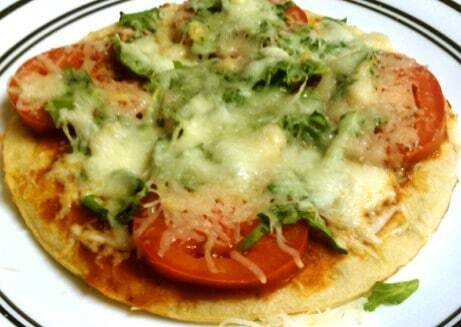 Some of the healthy ways are to make a pizza crust out of pita pockets or a whole grain tortillas. You can always use Pillsbury crust from the refrigerated section or the already made  crust such as Boboli or Mama Mary’s crust. In this quick and easy dinner recipe this pizza can be made in less than 10 minutes and still be a healthy pizza recipe that you will love. A margarita pizza has only a couple of ingredients and if you do not have them in your house you can always improvise. For instance, I did not have fresh basil on hand so I used the fresh spinach that I had. You can do layers of each topping on your pizza until all ingredients are stacked on the pizza. Once you have all the items on the pizza that you want just pop it in the oven and follow the directions on the back of the package of the crust. If it’s the pita pocket or tortilla crust keep an eye on it because it will take less time than you think. Check it at about 3 minutes. If you like a crisper crust just place it on the oven rack instead of a cookie sheet or a pizza stone. Once the cheese is bubbly pull your homemade pizza out of the oven and you have a quick healthy dinner meal ready to eat in minutes. A great side dish to add to this meal is a garden salad with light dressing to make this meal complete. Tip: Do not use fat free cheese as it will not melt properly. Place the crust flat side up. Next pour sauce onto the crust and spread around with a spoon to the edges. Slice tomatoes about ¼ inches thick. Place the spinach evenly around the crust. Next add the tomatoes and top with the cheese. Place in the oven either on a cookie sheet for a soft crust or on the oven rack for a crisper crust. Cook until the cheese is bubbly and golden brown. Pull out of the oven and let cool then slice and serve.